G. Budelli, L. Ni, C. Berciu, L. van Giesen, Z.A. Knecht, E.C. Chang, B. Kaminski, A.F. Silbering, A. Samuel, M. Klein, R. Benton, D. Nicastro and P.A. Garrity. (2019) Ionotropic Receptors Specify the Morphogenesis of Phasic Sensors Controlling Rapid Thermal Preference in Drosophila. Neuron, 101:738-747. C.Greppi, G. Budelli, and P.A. Garrity (2015). Some like it hot, but not too hot. eLife, e12838. M. Klein, B. Alonso, A. Vonner, L. Hernandez-Nunea, M. Berck, C.J. Tabone, E.A. Kane, V. Pieribone, M.N. Nitabach, A. Cardona, M. Zlatic, S. Sprecher, M. Gershow, P. Garrity, and A.D.T. Samuel (2015). Sensory determinants of behavioral dynamics in Drosophila thermotaxis. PNAS, 112: E220-229. PMC4299240. P. Sengupta and P. Garrity (2013). Sensing temperature Current Biology 23, R304-R307. J.G. Bernstein, P. Garrity, and E.S. Boyden (2012) Optogenetics and thermogenetics: technologies for controlling the activity of targeted cells within intact neural circuits. Current Opinion in Neurobiology 22:61-71. G.G. Neely, A.C. Keene, P. Duchek, E.C. Chang,Q.P. Wang, Y.A. Aksoy, M. Rosenzweig, M. Costigan, C.J. Woolf, P.A. Garrity, J. Penninger. (2011) TRPA1 regulates thermal nociception in Drosophila. PLoS One 6:e24343. S. Lahiri, K. Shen, M. Klein, A. Tang, E. Kane, M. Gershow, P. Garrity, A.D. Samuel (2011) Two alternating motor programs drive navigation in Drosophila larvae. PLoS One 6:e23180. P.A. Garrity (2011) Weakly acidic, but strongly irritating: TRPA1 and the activation of nociceptors by cytoplasmic acidification. J. General Physiology 137: 489-491. D.A. Glauser, W.C. Chen, R. Agin, B.L. Macinnis, A.B. Hellman, P.A. Garrity, M.W. Tan, M.B. Goodman. (2011) Heat Avoidance is Regulated by Transient Receptor Potential (TRP) Channels and a Neuropeptide Signaling Pathway in Caenorhabditis elegans. Genetics 188:91-103. P.A. Garrity. (2010) Neuroscience: Feel the light. Nature 468:900-901. Neely GG, Hess A, M. Costigan, Keene AC, Goulas S, Langeslag M, Griffin RS, Belfer I, Dai F, Smith SB, Diatchenko L, Gupta V, Xia CP, Amann S, Kreitz S, Heindl-Erdmann C, Wolz S, Ly CV, Arora S, Sarangi R, Dan D, Novatchkova M, Rosenzweig M, Gibson DG, Truong D, Schramek D, Zoranovic T, Cronin SJ, Angjeli B, Brune K, Dietzl G, Maixner W, Meixner A, Thomas W, Pospisilik JA, Alenius M, Kress M, Subramaniam S, Garrity PA, Bellen HJ, Woolf CJ, Penninger JM. (2010) A genome-wide Drosophila screen for heat nociception identifies alpha2delta3 as an evolutionarily conserved pain gene. Cell 143:628-638. P.A. Garrity, M.B. Goodman, A.D. Samuel, and P. Sengupta. 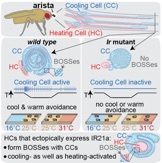 (2010) Running hot and cold: behavioral strategies, neural circuits and the molecular machinery for thermotaxis in C. elegans and Drosophila. Genes and Development 24:2365-82. V.C. Panzano, K. Kang, and P.A. Garrity. (2010) Infrared snake eyes: TRPA1 and the thermal sensitivity of the snake pit organ. Sci. Signaling 3:pe22. L. Luo, M. Gershow, C. Fang-Yen, M. Rosenzweig, K. Kang, P.A. Garrity*, and A.D. Samuel*. (2010) Navigational decision-making in Drosophila thermotaxis. J. Neuroscience, 30, 4261-4272. M.E. Dillon, G. Wang, P.A. Garrity, and R.B. Huey. (2009) Thermal preference in Drosophila. Journal of Thermal Biology, 34, 109-119. S.R. Pulver, S. Pashkovski, N.J. Hornstein, P.A. Garrity, and L.C. Griffith. (2009) Temporal dynamics of neuronal activation by Channelrhodopsin-2 and TRPA1 determine behavioral output in Drosophila larvae. Journal of Neurophysiology, 101, 3075-3088. K. M. Parisky, J. Agosto, S. R. Pulver, Y. Shang, E. Kuklin, J.L. Hodge, K. Kang, X. Liu, P. A. Garrity, M. Rosbash and L. C. Griffith. (2008) PDF cells are a GABA-responsive wake-promoting component of the Drosophila sleep circuit. Neuron, 26, 672-681. F. Hamada, M. Rosenzweig, K. Kang, S. R. Pulver, A. Ghezzi, T.J. Jegla and P.A. Garrity. 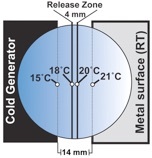 (2008) An internal sensor controlling temperature preference in Drosophila. Nature, 454, 217-220. M. Rosenzweig, K. Kang, and P.A. Garrity. (2008) Distinct TRP channels are required for warm and cool avoidance in Drosophila melanogaster. PNAS, 105, 14668-14673. P.A. Garrity. (2007) The role of adaptation in C. elegans thermotaxis: Focus on "Short-term adaptation and temporal processing in the cryophilic response of Caenorabditis elegans" Journal of Neurophysiology, 97, 1874-1876. J. Whited, M. Robichaux, J.C. Yang, and P.A. Garrity. (2007) PTPMEG is required for the proper establishment and maintenance of axon branches in the Drosophila central brain, Development, 134, 43-53. R. Khodosh, A. Augsburger, T. Schwarz, and P.A. Garrity. (2006) Bchs, a BEACH domain protein, antagonizes Rab11 in synapse morphogenesis and other developmental events, Development, 133, 4655-4665. P.A. Garrity (2005). Tinkers to Evers to Chance: Semaphorin signaling takes teamwork. Nature Neuroscience 8, 1635-1636. T.D. Tayler, M. Robichaux, and P.A. Garrity. (2004). Compartmentalization of visual centers in the Drosophila brain requires Slit and Robo proteins. Development 131:5935-5945. J. Whited, A. Cassell, M. Brouilette, and P.A. Garrity. (2004). Dynactin is required to maintain nuclear position within postmitotic Drosophila photoreceptor neurons. Development 131: 4677-4686. H.C. Sears, C.J. Kennedy, and P.A. Garrity. (2003). Macrophage-mediated corpse engulfment is required for normal Drosophila CNS morphogenesis. Development 130: 3557-3565. P.A. Garrity (2003). How neurons avoid derailment. Nature 422, 570-571. T. Tayler and P.A Garrity (2003). Axon targeting in the Drosophila visual system. Curr. Opinion Neurobiology 13, 90-95. M. Rosenzweig and P.A. Garrity (2002). Axon targeting meets protein trafficking: Comm takes Robo to the cleaners. Dev. Cell 3, 301-302. J. Whited and P.A. Garrity (2002). Specifying axon identity with Syd-1. Nature Neuroscience 5, 1107-1108.